Carolyn has a weekly meme on Thursdays called Messy Little Details. Find out about it here. Why don't you join in? The last MLD post from our New England holiday. This clock was on the wall in a restaurant we were in and I love map-related things. Have a look at this Pinterest board! It's almost the end of October but there's still time to decide to join in with An Attitude of Gratitude for the month of November. Nip over to the blog to find out more. Here are some sneak peeks from my journal. I do hope you'll join us for a month long look at gratitude. You would think I would learn, wouldn't you?!? You know how I sign up for online classes. I promised myself this year I wouldn't take on too many. I signed up for One Little Word, 21 Secrets and Lifebook 2013 at the end of last year. But to be truthful I've hardly done anything from these courses. And then I think I was relatively good and didn't sign up for any online courses, although I did go to some actual workshops. Make It Personal at the NEC and the one with Tim Holtz plus some others at Art from the Heart. And then I caved! I started signing up for things and instead of writing them down - with the start dates - I just kept on signing. And then I discovered that they are all happening at once! I am reading The Artist's Way as a book study and online free class with Sandie. If you want to join in then you need to sign up straightaway as the deadline is 1st November. One of Julia Cameron's ideas is that you write Morning Pages. Have I done any? No, nada! I have bought a new notebook to do them in but not actually taken the cellophane off it yet! I signed up for Made which is an 18 week course and have managed one week of that, where I made this book. And then there's Onwards & Upwards from Lemon & Raspberry. Fortunately I only need to read the daily posts and think! Although I expect I could put some more effort into it. I signed up for five day of Chemistry 102 with Tim Holtz and I have watched some of the videos but not actually made the tags or tried out the techniques! And then there's Stencil Play with Carolyn Dube. She is an amazing teacher and I'm really enjoying the class. I was away at the beginning of the week when it started so on Thursday I spent the afternoon catching up. Lastly there's the Brene Brown 'The Gifts of Imperfection' eclass hosted by Oprah. I love the book and the TED talks that Brene had done so it's not surprising that I gave in very quickly to signing up for this. We are at the end of week 1 and I am all up-to-date with the art. This is page 3. Next week I'm off to The Bramble Patch to do a two day workshop with Steph Redfern called Thrift & Alchemy. However just to confuse me it's been combined with another class called Into the Rainforest. I'll let you know how I get on! And in the midst of all this I have been preparing all the blog posts for An Attitude of Gratitude 2013. Do come and join in. The art challenge on 12 Months in View today is to make a page inspired by the poem October's Party. I had cut some leaves from paper and some acetate packaging at the beginning of September and I still had some of them. I put them randomly on the journal page. I sprayed inks over the page and then removed the leaf masks. You could do this with actual leaves. I printed out the poem on the inside of a brown envelope. I made myself a leaf shape and cut out the words in the leaf shape. I stuck the paper leaves down on the page. And then the printed leaves. I used letters from my stash for the title. I took this on our whale watching trip. I love the colours, the reflections and the ripples in the sea. This is straight from the camera without any photo editing. Last year for the month of November I ran a challenge blog, An Attitude of Gratitude, where participants found a quote, a Bible verse, an inspirational video, some journaling prompts and an art technique challenge. Those who completed the thirty days had a complete journal. These are some of my pages. And I am pleased to announce that there is a new blog for 2013: An Attitude of Gratitude 2013. Each day throughout November there will be blog posts much like last year's blog - which is still available if you wish to work through that one. The major difference is that this year instead of a different technique every day there are a series of techniques allocated to a number of days and you can choose which of them to use on a particular day. Of course, you don't have to art journal to take part. You can use the quote, the verse and the journaling prompts and scrapbook, blog, make notes, sew or just think. Have a look at how Valerie interpreted the challenge last year. So do have a look at the new blog challenge at An Attitude of Gratitude 2013 and I hope you will join in. It would be great to have you there. The masts of the USS Constitution. This is a photo from our recent holiday. The ship is moored in Boston Harbour. I love the pattern the ropes (sheets) make against the clear blue sky. Who would have thought we would have weather like that at the end of September! In a change to the advertised programme the Flower of the Month on 12 Months in View is the Cow Parsley. It was originally going to be the Teasel but I changed my mind - last week! 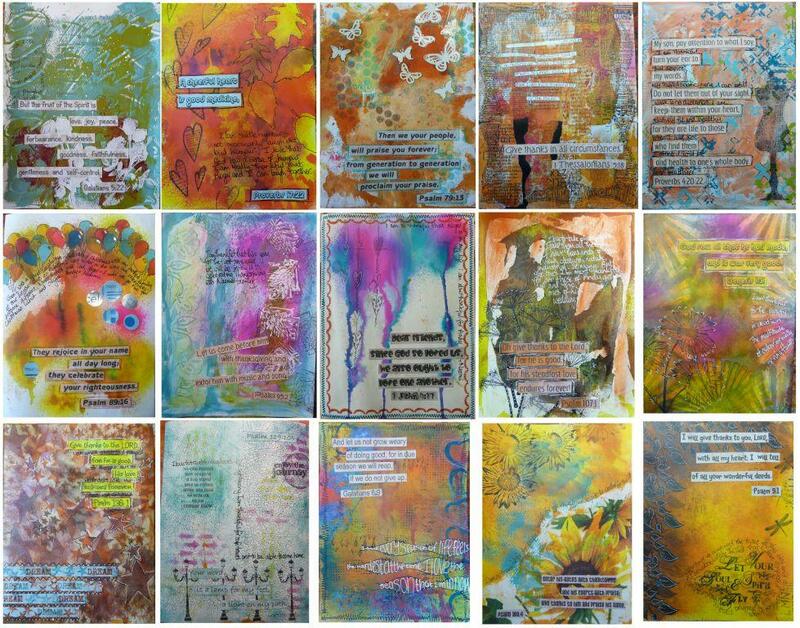 I really enjoyed using the Thermofax Screen at the beginning of the month so I used two on this page with the Amsterdam acrylics. I think I needed to apply the paint a bit thicker in order to get more of a resist. I coloured the page with several colours of Distress Inks. Then stamped using Archival Ink. This has given me a great idea. I am going to New England for a holiday soon. I always buy postcards when I'm away despite the 1000s of photos I take. I often put postcards into my travel journal but I think this time I will send myself a postcard every day to record our holiday. When I get back I shall have an almost ready made journal. I didn't send the postcards to myself but I did buy them and write on them each day to record our trip. Here are the postcards that I use plus a few spares! Now that I'm home after 3 days in Boston and 1580 mile drive through Massachussets, Vermont, New Hampshire and Maine I have put together my journal. Whilst we were away I picked up any free maps that were available. I cut up some cardstock into 6x4" pieces to stick the maps onto. I cut out a piece of 6x4" acetate from a piece of packaging so that I could place it on the map to see which bits I was going to cut out. I trimmed down the postcard that I had bought to be the cover so it is 7x5" and cut a piece of chipboard the same size to make the back cover. I put the postcards into the right order and then went through them adding the appropriate maps. I put some autumnal paper on one side of the back cover and stuck a postcard on. I didn't see this sign but we did go through Mexico and I went to Peru on my last New England visit. I printed out a map of New England from Google maps and stuck it on the inside of the back cover. Here's a short video of how the book looks. I filmed before I bound it together as I thought it would be easier to turn the pages for the filming. I punched the holes in each page and put the book rings through. I didn't like how it looked with ribbons attached to the rings but it looks slightly unfinished. Will have to give it some thought. Christians often get a bad press about asking God for things like parking spaces. Actually Christians often get bad press! That aside, I don't often share the things that God does for me but during this last holiday some amazing blessings came our way. And I know that there were people praying God's blessing for us whilst we were away. We arrived at our hotel in Boston to be greeted with "Welcome. We have upgraded you to a suite". We walked in and there was a short corridor with the bathroom at the end. Turned right into the lounge and then right again into the bedroom. We hoped to visit the Museum of Fine Arts in Boston but when we got there it was $25 each to get in. We only had a couple of hours and really thought it was way too expensive so we walked away. As we walked along the street there was a man, a woman and a young man admiring a sports car and out of the blue they spoke to us about it. We started talking and said how expensive the museum was and how we were going to give it a miss. The woman said to go with her. She turned out not to be with the other people and was on her way to work in the visitor information department of the museum. She gave us free tickets and so we went in and looked at American art and furniture from 1400 to the present. We hadn't booked anywhere to stay as we toured around New England. Some evenings we looked at where we thought we might get to and booked something on the internet with varying results of quality. However we hadn't booked anywhere on the Maine coast for the Wednesday night. We drew up outside a beautiful looking Inn and Roger went in to enquire. The receptionist asked him what sort of rate he wanted to pay!!! He said a low rate would be good. She said would $89 be okay so he said yes. We were given yet another suite and when we looked it up on the internet it should have cost us $150. And this was the view when we sat in the garden for breakfast the next day. We continued our travels but after nearly having to sleep in the car on the Thursday night decided we should book ahead for Friday and Saturday. When we arrived at the hotel on Friday where we had booked a standard room, we walked in and the noise was terrible and the floor vibrated. One of the hotel staff came to investigate which of course was when it stopped. He went off to find out what it was and in the meantime the phone went and the receptionist said that we would be moving rooms with a free upgrade, and that the valet was on his way to move our luggage! And the upgrade was to a - you've guessed it - a suite! With this view from the balcony. What amazing blessings. Thank you God. And thank you those who were praying. Sometimes things didn't work out - for example I was badly bitten by mosquitoes and the last night was in a smoking room instead of a non-smoking because I didn't read the booking website properly. At the Airport on Sunday I was chatting to God and said it would be really great to have an upgrade but if not, Roger and I having the 3 seats just for us would be great. We got on the plane and found ourselves sat next to a very tall guy. However shortly before takeoff the flight attendant asked him if he would like to move to another row where he would have more room - so we got our 3 seats. Isn't God good? Having finished a series of Munich holiday photos, I am now going to share photos from my New England holiday. We got back on Monday this week. I took over 800 photos so it's going to be hard to choose. As we walked round Boston we found several pianos where people could just sit down and play. Most of them were upright pianos but outside the Museum of Fine Arts there was a grand piano. The piano was set up to be a replica artists studio and here is the top of the piano. And my last photos from my holiday. I have never seen Love Locks before so had to take a photo or three!